The one downside is that I tend to read non-fiction books super slowly. It is probably because I am one of those millennials with a short attention span (although that somehow doesn’t apply to fiction books). In any case, I don’t seem to be able to finish a non-fiction book within the allocated 3 week borrowing period at my local library and as a result I’m halfway through a bunch of really good books which I hope to finish one day. Who? Friends of the Earth and C40 Cities. Two awesome organisations – FoE is a global network of grassroots environmental organisations founded almost 50 years ago, while C40 is a cooperative of 96 cities working towards tackling climate change. What? Why Women Will Save the Planet. Why? With a title like that, how could I resist? 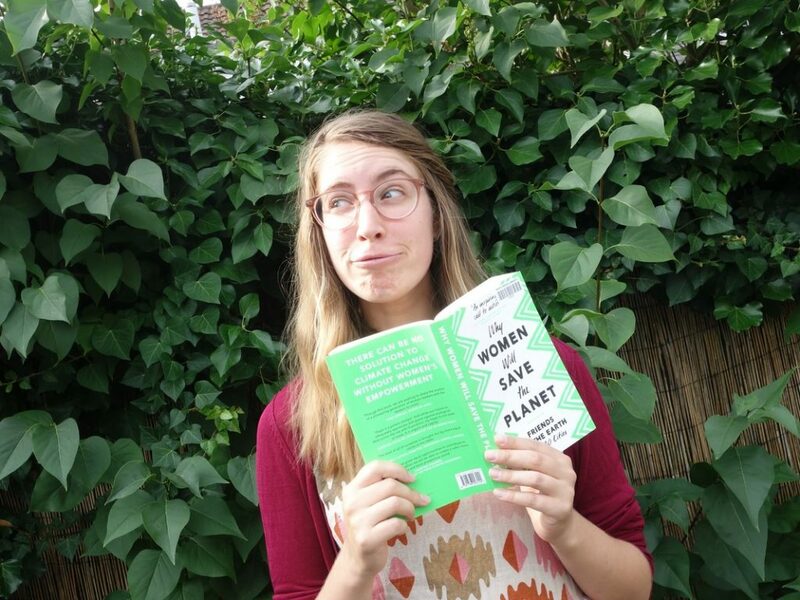 This book is a compilation of articles and interviews with women leading the climate change movement all over the world. There is so much inspiration packed into this book, with stories ranging from very local case studies to insights into global climate agreement negotiations. In the meantime…Mothers of Invention is an excellent podcast which explores women’s role in solving the climate crisis. C40 has also published some really interesting reports, including Deadline 2020 (which examines action needed by cities to meet climate change targets of the Paris Agreement). Why? I’m so fascinated by the concept of rewilding. Conservation has often been about preserving nature the way that we humans think it should be. Rewilding is more about letting nature do its own thing. I have borrowed this book a couple of times already – the only problem is that every time I start reading it I really want to go outside and frolic in some trees. So I never get any reading done but perhaps this is not such a bad thing. In the meantime…Monbiot writes a column for the Guardian which covers a wide range of topics. Recent widely shared columns have discussed coffee cups and veganism. Why? Again, with a title like that it is just begging to be read. My understanding of climate change and the surrounding issues mostly comes from a science/engineering/technology background, so I am always fascinated to learn more about the economic perspective. Who? Kate Raworth, an economist that thinks a bit differently. Why? I think the headline doughnut model is a fantastic and simple way to explain what we should be aiming to achieve with sustainable development. It basically says that there is a minimum impact on the earth that we will have in order to provide enough for people to live, and also a maximum impact that the earth can sustain. Humanity needs to live within the ‘doughnut’ between those two limits. It is a very powerful concept, and the book also presents a range of supporting arguments that break down a lot of traditional economics theories – all discussed in an easy-to-understand way! In the meantime…If you are interested in understanding the title idea of doughnut economics in 16 minutes, check out Kate’s TED talk. Who? Michael Pollan. I really appreciate his very famous quote/manifesto (eat food, mostly plants, not too much) so thought I should actually read some of his books. Why? Having been vegetarian for quite a while I thought this would be a good book to start with. I have already read the first part of the book, all about corn. As someone who delights in eating corn on the cob each summer (except this most recent one, it doesn’t seem to be so available in the UK), I never realised just how much it has infiltrated the entire industrialised food system in the US. In the meantime…I turned vegetarian without watching any heart-wrenching documentaries, but I have been meaning to watch Cowspiracy and Dominion (an Australian one!). Who? A coalition of over 200 researchers, scholars, scientists, policy makers and business leaders contributed to this project, lead by Paul Hawken, an environmentalist, activist and author. Why? Rather than dwelling on the problem, this book jumps straight into solutions. An incredible amount of research sits behind the ideas, which quantifies the benefits of 80 ranked actions to reverse (not just slow down) global warming. It points to actions that are robust, scalable and will have benefits beyond just reducing greenhouse gas emissions, such as educating girls and family planning (ranked at 6 and 7). In the meantime…the Drawdown website has so much to explore, including continual updates to the research. And if that isn’t enough inspiration, check out this epic compilation of books to ‘change the world’. I just had a notification from the library that Drawdown is ready to pick up, so I know what I’ll be reading this week. What’s on your list? I’d love to hear any recommendations!